India is a land of festivities and various different festivals are celebrated. Being the colorful nation that India is, the most vibrant harvest festivals of India involve interesting mythological legends and joyous celebrations. They are incredible and diverse just like its people and landscapes and let’s one experience the beauty of the Indian culture. Jallikattu also known as eru thazhuvuthal and manju virattu, is one of those traditional spectacles(started from about 100 BC) in which a Pulikulam or Kangayam bull is released into a crowd of people, and multiple human participants attempt to grab the large hump on the bull’s back with both arms and hang on to it while the bull attempts to escape. 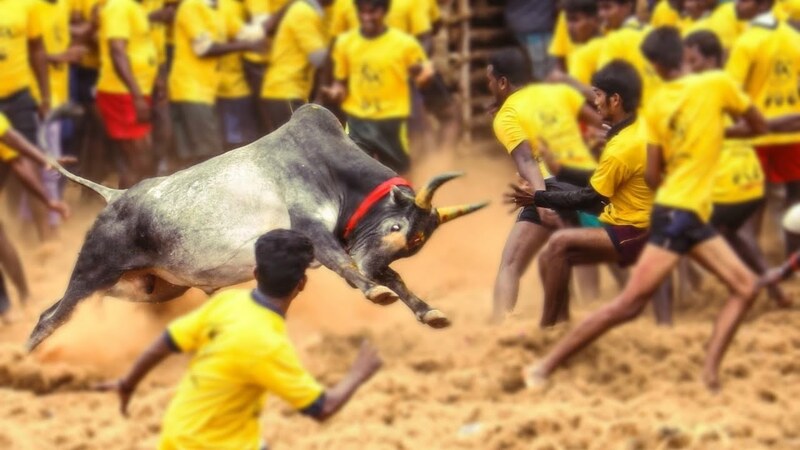 Participants are supposed to hold onto the hump for as long as possible, in an attempt to bring the bull to a stop. In some cases, participants must ride long enough to remove flags on the bull’s horns. Pulikkali originated from the state of Kerala as a recreational folk art. It is performed by trained artists to entertain people on the occasion of Onam, an annual harvest festival. The fourth day of Onam witnesses (Nalaam Onam) where performers painted like tigers and hunters in bright yellow, red, and black dance to the beats of instruments like Udukku and Thakil. The literal meaning of Pulikkali is the ‘play of the Tigers’ hence the performance revolves around the theme of tiger hunting. The origin of Pulikkali dates back to over 200 years when Maharaja Thampuran od Cochin is said to have introduced the folk art, who wanted to celebrate Onam with a dance that reflected the wild and macho spirit of the force. Madai festival is one festival originating from Chhattisgarh. The festival reflects the rich culture and tradition of the state, celebrated by the Gond Tribe from the month of December to March and tours from one place of the state to another. The local tribes of the state along with other communities worship the presiding deity during the festival. The tribal people of Chhattisgarh launch a procession in the beginning on an open field where a large number of devotees and general tourists gather to witness the rituals, followed by the Puja ceremony where the priest or similar figure starts worshiping the goddess. When the worshiping finishes, several cultural events like folk dance, drama, songs etc. start taking place in the open space. Mim Kut Festival is a post-harvest festival celebrated in Nagaland and also in parts of Mizoram by the Kuki Nagas. It is one of the many popular festivals of Nagaland. It expresses exhilaration and triumphant over the harvest of Mim (Maize), which is the last harvest crop for the season. The Kuki people hold strong belief that the souls of their deceased ancestors rise from their graves and visit their family homes. The people offer tribute to the dead souls in form of wine that is naturally prepped from rice at every home. These dead souls are also worshiped by the villagers. The Mim Kut festival like most festivals of Nagas includes tradition singing, dancing, playing musical instruments and proud display of culture. 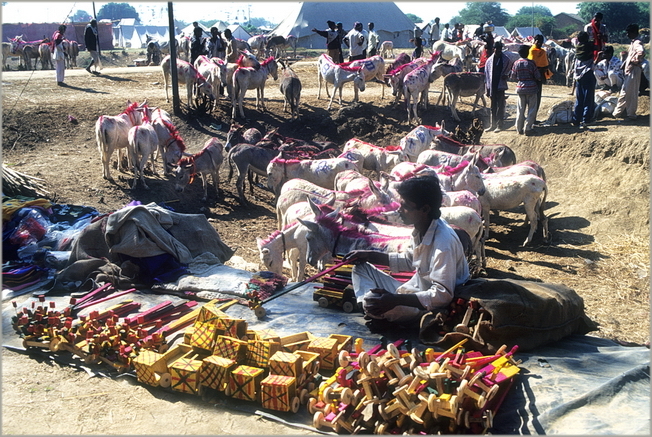 Vautha Fair originating from Gujarat is one where tens of thousands of donkeys, as well as hundreds of camels, adorned in an array of colors and bright embellishments, are brought where they are traded on the fairgrounds at the Sangam tirtha. For some, this place is as divine as the Sangam in Allahabad, while many communities consider this fair even more important than Diwali. This is the meeting place of seven holy rivers: the Vatrak merges with the Meshwo, Hathmati, Shedhi, Majum, and Khari before it then meets the Sabarmati, so the locals call it Saptasangam (i.e. the meeting of seven). These were a few. If the same tingles your inquisitive self then follow the link for more https://traveltriangle.com/blog/harvest-festivals-of-india/.